Found in many African countries and created by local artists, barber shop signs are painted on plywood using bright, vibrant, colors. Traditionally, these signs were used to advertise the names and distinctive haircuts and hairstyles that were often designed by imaginative stylists for salons. The current incarnation of barber shop signs, particularly those from South Africa, now reflect social and political message against the backdrop of style and fashion. The Herskovits Library’s collection of political “barber shop” signs has grown substantially and depicts politicians and events that resonate with South Africa and its interaction with the world. 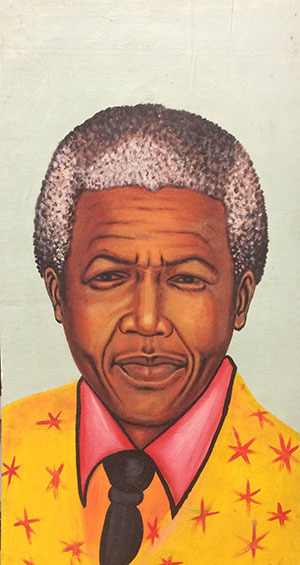 President Mandela, President G.W. Bush, Hillary Clinton and the World Cup, are just some of the images represented in this new and flourishing collection of ephemera.